Currently, AlphaNDT have executed NDT work for Phu My 2.2 Power Plant due to contract with Agon Pacific, a Thailand Power and Energy Solutions provider. The work scope include PAUT, MT, PT and PWHT for power pipe of main Generators. The services have been performed under supervision of General Electric Company (GE). Presently, AlphaNDT have been conducting the contract to supply NDT services (RT, MT, PT, UT) for vessel construction projects of Strategic Marine Company at Dong Xuyen Inductrial Zone, Vung Tau City. Currently, AlphaNDT have been in provision of RT, UT, MT, PT services for Thang Long – Dong Do jackets fabrication as assigned by Vietsovpetro. Recently, AlphaNDT have been performing NDT for Hook-up & Commissioning of Moc Tinh 1 Wellhead Platform (WHP-MT1), Hai Thach 1 Wellhead Platform (WHP-HT1) and Hai Thach Production and Quarters Platform (PQP-HT) that belong to Bien Dong 1 Field Development. 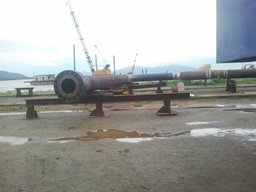 Since September 2012, AlphaNDT have been executing NDT (RT using X-ray machine, MT, UT, PT) for onshore fabrication of 16”,8”,6”pipeline system which is a part of Hai Su Trang– Hai Su Den Development project which to construct two topsides and two jackets with total weight of 5,000MT. Currently, AlphaNDT have been performing NDT (RT,UT,MT,PT) for 26” & 20” pipeline system fabrication which belongs to Bien Dong 1 field development project. AlphaNDT have just finished project to supply VI and NDT services for 03 Spherical Tanks at Go Dau LPG Storage. Currently, AlphaNDT have executed NDT for Hai Su Den – Hai Su Trang Development project for which AlphaNDT perform RT, MT, PT, UT for pile system construction at PTSC Phu My Yard. Currently, AlphaNDT have been performing Visual Inspection and NDT services for 03 stations LFS (Landfall station), LBV (Line Block Valve) and GDC (Gas Distribution Center) of Ca Mau processing plant due to contract with PVGas.